Luxury Home Plans Architect, European Style Castles and Mansions and American classical period luxury houses and plans created by premier Architect John Henry. 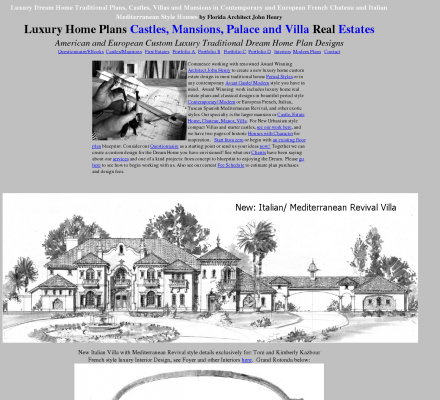 Luxury Homes House Real Estate Floor Plans Residential Castle Manor plans. Architect for Home Designer Blueprint Plans, Classical style Luxury House Plans and traditional home plan custom design for Estate Luxury house plan blueprints. Description: Luxury house plans, castles and mansions designed for the rich and famous. Be inspired by European our plans for luxury home style real estate. TinyHouses (Popularity: ): Examples of tiny houses and out buildings used for guest quarters, vacation, office space, or study.